The National Cherry Blossom Festival Parade is one of Washington, DC’s largest public events of the year, drawing about 100,000 spectators from around the world. The parade combines wonderful entertainment for the whole family including decorated floats, gigantic colorful helium balloons, marching bands, clowns, celebrity performances, youth chorus members, dancers, high school marching bands, and various cultural performing groups. Dates for this year's festivities run from March 20 through April 14 with the parade on April 13 from 10 a.m. to noon, and there are a variety of events taking place around D.C. all month to celebrate the occasion. 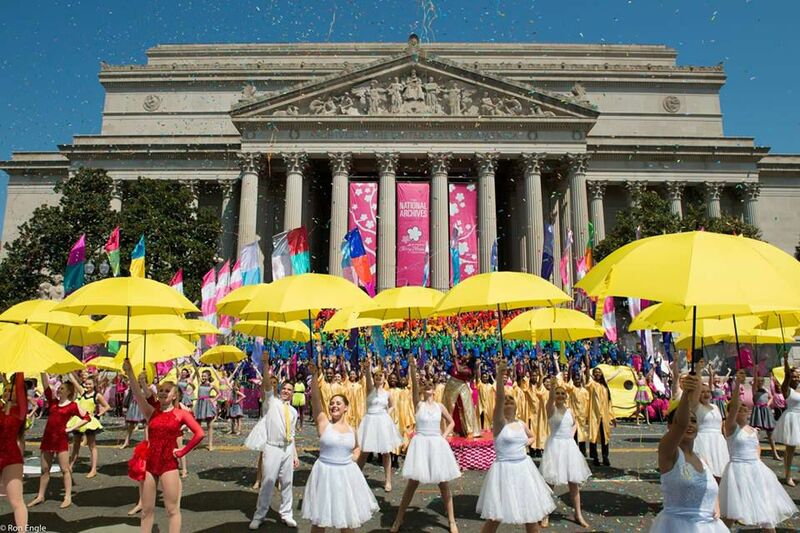 Be sure to check the official National Cherry Blossom Festival website for up-to-date information on hosts, performers, and a full schedule of events. This year, the parade route runs along Constitution Avenue beginning at 7th Street and ending at 17th Street, passing many D.C. attractions including the National Archives, the Department of Justice, Smithsonian Museums, the Washington Monument, and the White House. This is one of the biggest events of the year and parking is extremely limited. The best way to get to the parade is by Metro, and the closest Metro stations are Archives/Navy Memorial, Federal Triangle, and Smithsonian. For more information about getting to the festival, see our Cherry Blossom Festival Transportation Guide. The parade is free and open to the public, but for $20 to $30 you may purchase a reserved grandstand seat. The reserved seating section is along Constitution Avenue, between 15th and 17th Streets, providing the best view of all the floats and performers. However, space is limited so make sure you reserve your spot today if you plan on purchasing a reserved seat. The 2019 Cherry Blossom Festival kicks off with a Pink Tie Party fundraiser at the Ronald Reagan Building and International Trade Center on Friday, March 22, but the official opening ceremony takes place at the Warner Theater and the SAAM Cherry Blossom Celebration produced by the Smithsonian American Art Museum takes place on Saturday, March 23. The parade itself, presented by Events DC, takes place on April 13. The Festival's new Petalpalooza event at the newly developed District Wharf is back again this year. Guests are invited to enjoy multiple music stages, interactive art, life-sized games, fireworks, and a day-long celebration of all that blossoms in D.C. This year will also see a special event for baseball fans called Blossoms and Baseball with the Washington Nationals on April 3, the North American debut of the “Pretty Guardian Sailor Moon” musical at the Warner Theatre, and an inaugural picnic at Oxon Run Park in Ward 8's grove of cherry blossom trees. For more information on last year's events, check out this photo gallery so you'll know what to expect on your trip to the Cherry Blossom Festival and Parade. The National Cherry Blossom Festival is an annual two-week, city-wide event featuring more than 200 international cultural performances and over 90 other special events. For a complete list of performers and events, check out this National Cherry Blossom Festival schedule.